As much as we tend to focus on the “natural” triggers for disaster – in this case heavy rain – the reality is more nuanced. These incidents are often also the result of flawed development, and as such they are social and political disasters too. A map of dams on the lower Mekong. We have seen this before, both in Laos and in its neighbouring countries. The Nam Song Diversion Dam, completed in 1996, affected more than 1,000 Laotian families – first by removing their access to productive agricultural land and causing a severe decline in fish stocks. Since then, deliberate water surges – for electricity generation – have been blamed for three deaths and widespread loss of boats and fishing equipment. The Nam Theun 2 Hydropower Project boasted rigorous social and environmental safeguards – but these soon became broken promises. This project also followed a disturbing trend relating to hydropower development in Southeast Asia: the dispossession of already marginalised ethnic minorities. The World Bank ranked Laos as the 13th fastest growing economy of 2016, and the Asian Development Bank predicts that its economy will grow at 7% a year for the remainder of this decade. Who should we blame for the Brazil mining dam disaster? Another powerful aftershock hit Papua New Guinea this weekend as the recovery effort continues following February’s deadly magnitude 7.5 earthquake, with many thousands of people dependent on humanitarian aid. Aid organisations such as CARE Australia and UNICEF are still seeking donations. The Australian government has sent medical staff and other support to help. Some have criticised the PNG government’s efforts as “too slow”. But the earthquake highlights the challenge for emerging economies like PNG in deploying relief efforts into remote areas to deal with natural disasters. And the same geological features that make PNG a rich source of mineral deposits are also part of its earthquake problem. The February earthquake struck the western Highlands provinces of the Pacific island nation, and a series of aftershocks, including several of magnitude 6 or more, continued to shake the region during the following weeks. Although parts of PNG are particularly earthquake-prone (especially in the north and the islands, along the plate boundary), February’s earthquake was quite exceptional. It occurred in a usually less active part of the plate boundary and was remarkably powerful when compared with the short (modern) instrumental earthquake record. The strength and frequency of the aftershocks has posed an additional threat to local populations and key economic infrastructure. On average 10-20 major earthquakes (magnitudes 7 and greater) occur on Earth every year. Most of them occur far from densely populated regions, such that only a few draw media attention. The mountainous regions of New Guinea, known as the fold and thrust belt, have been geologically active for millions of years. But the long recurrence interval of major earthquakes (every few centuries) combined with the short period of the instrument records (just a few decades) gives us the false impression that seismicity is uncommon in this region. The February earthquake occurred due to the activation of a major fault system in the forested foothills, between the Papuan highlands to the north and the Fly River lowlands to the south. The Papuan highlands have risen due to the collision between the Australian and Caroline/Pacific tectonic plates over the past five million years. Despite this collision, the Australian plate continues to move at about 7 cm a year to the northeast, in geological terms a quite remarkable speed, leading to a build-up of strain in the continental crust. Much of this strain is released at the plate boundary along northern New Guinea, usually with more frequent but less powerful swarms of earthquakes. It is this motion, driven by the churning interior of our planet, that leads to major adjustments to the GPS datum and reference coordinates for the entire Australian continent. But few people are aware that this very motion of the Australian continent is what causes the seismic and volcanic activity in New Guinea and parts of Southeast Asia. As Australia moves northward, the entire New Guinea margin acts as a bulldozer, collecting Pacific islands, seamounts and other topographic features. New Guinea represents the leading edge of the advancing Australian continent, which causes continental crust to fold and crumple over a broad region. This is a well-known process in plate tectonics, where the oceanic plates are known to behave quite rigidly, whereas the continental regions tend to deform over broader diffuse boundaries that resemble plasticine over geological timeframes. But the continental deformation process results in poorly defined (often due to the thick tropical vegetation cover) and intermittently active fault systems in the continent. Over the duration of mountain building in the past five million years, the areas of highest deformation have shifted across the range. Today most of the deformation in PNG takes place north of the mountainous area, where it generates a lot of earthquakes. Some substantial crumpling of the continental crust still occurs across the southern foothills. The folding and thrusting has generated geologically young folds, within which a large part of PNG’s gas and oil wealth has accumulated. The intense tectonic activity has also led to the enrichment of mineral resources, including mines sourcing gold, copper, silver, nickel, cobalt and a suite of other ore types. Distribution of the aftershocks magnitude 4+ since the main quake (as of April 9, 2018). The size and colour (small to large, yellow to red) indicate aftershock magnitude and D+ the number of days after main shock. The white shaded ellipse represents the area of greatest slip during the main shock. Green diamonds represent the main gas fields. It is this tectonic activity that determines the delicate interplay of economic benefits from raw materials, and the often-devastating and usually-unpredictable effects of natural disasters on society. Although the February earthquake occurred at the very heart of one of the largest and newest gas fields in the country, the industrial installations, at the highest international standards, have not suffered major damage from the tremors. But the ongoing disaster triggered a temporary halt in gas extraction, as the facilities require inspections and repairs. Unfortunately, and unusually, the earthquakes have struck in some of the most remote parts of the country. Hela province is one of the poorest in PNG and its people are unprepared and ill-equipped to deal with a disaster of this scale. As many as half a million people were reported to be affected by the earthquake. At least 145 people reported killed. The Highlands Highway, the one real road into the region, was badly damaged and this is the major source of food and medicines. Many feeder roads have gone. Papua New Guineans are resilient but it is likely that more external assistance will be needed to ensure that a physical disaster does not become a greater human tragedy. Even so the full extent of the disaster has still to be revealed, while aftershocks continue to trigger secondary hazards including major landslides that have isolated a large number of communities. Not only are local communities facing the immediate hazards of further earthquakes and landslides, they face a protracted and costly recovery ahead. Fallen trees and power lines are two of the main hazards that could have been reduced with better planning for cyclones. Darwin was directly in the path of Cyclone Marcus and suffered severe impacts from wind gusts up to 130km/hour on Saturday, March 17. Northern Territory authorities made no declaration of emergency, but the Insurance Council of Australia declared it a “catastrophe” for the Greater Darwin region. Marcus is considered the city’s second-worst cyclone since Tracy, which devastated Darwin on Christmas Eve 1974. The good news is that no deaths have been reported. But had it been a category 4 or 5 cyclone, instead of category 2, how would the city have fared? The post-Marcus chaos in Greater Darwin is not just “a real wake-up call”, but a typical case of lessons yet to be learned. For example, large shallow-rooted trees planted after Cyclone Tracy and overhead power lines brought down in the cyclone were both hazards that could have been avoided. Darwin is now engaged in a long, difficult and costly clean-up. Fallen trees posed one of the biggest hazards during and after the cyclone. There are on average 7.7 days per season when a cyclone exists in the Northern Region. So was there complacency among some residents, as emergency services warned? Did infrastructure providers underestimate the threat? In hot and humid weather, over one-third of Darwin’s population went without power for several days and safe-to-drink tap water for 48 hours. Communication networks were patchy for days. What was the reluctance in seeking immediate support from other states despite banks and insurers considering this a catastrophe? Was it due to Commonwealth disregard for the Top End in general? How well has Darwin coped? There have been at least two opposing views on the impact of the cyclone. The first is a more optimistic one, largely because no one got killed or seriously injured. Community members spontaneously helped one another in the immediate aftermath. On this view, although preparedness might have varied, people in general were prepared. Power outages for a few days were a “first world problem”. Most households were ready, for example, to use camping gas cookers. Volunteers visited and helped vulnerable groups such as aged and sick people. Emergency responders, defence staff and infrastructure restoration teams are working tirelessly to return the city to normalcy. On the other hand, Marcus uprooted thousands of trees across Greater Darwin, mostly African mahoganies, which were planted for revegetation after Tracy. Large shallow-rooted trees proved to be a poor choice for revegetating Darwin after Cyclone Tracy. Around 25,800 of about 60,000 properties across Greater Darwin were cut off from power. Even after a week many are still living in darkness. Power outages had cascading effects: traffic signals weren’t working for days at many places and food was left to rot in the heat. Water was cut off in places. For about 48 hours people were urged to boil tap water before drinking, cooking or brushing teeth. The Health Department issued a warning about melioidosis, a life-threatening disease spread by contact with soil, mud and surface water. Fallen trees blocked many roads and caused mild to severe damage to residential, commercial and public premises. Outdoor areas were cordoned off for safety. Educational institutions were closed for at least a day. People who didn’t own a car or were unable to drive were disadvantaged for almost three days until public transport was running again. At several locations, tree branches are still hanging dangerously over roads, pavements, parks and roofs. Anywhere in the city or suburbs, you see major and minor roads, parks and beachfronts dotted with uprooted trees and fallen branches. The roadside piles of logs and green waste are likely to remain there for some time, as their removal is not an “emergency priority”. What does a city do with so much waste? Waste facilities are struggling to cope. The morning after the cyclone, vehicles queued for hours at the green waste facility. It is yet to be ascertained if arrangements can be made to manage the huge quantities of green waste. Vehicles loaded with green waste queued for hours at the waste management facility. United Nations Environment Program (UNEP) guidelines note that waste debris presents opportunities as “either a source of income or as a reconstruction material, and [can] reduce burdens on natural resources that might otherwise be harvested for reconstruction”. An evaluation of green waste would help understand its recovery value. Research suggests that disaster waste management can account for 5–10% of the total recovery costs, often exceeding that of health care and education. In October 2004, a typhoon devastated Toyooka in Japan, producing 45,000 tonnes of waste – 1.5 years of the city’s usual waste production. The 2011 tsunami in Japan produced the equivalent of of 9 years’ worth of municipal solid waste in Iwate prefecture and 14 years’ worth in Miyagi prefecture. What can Darwin learn from this? Local government is considering removing mahogany trees, which were introduced after Tracy, because of their fast growth and the expansive shade their dense canopies provide. Globally, environmental dimensions of disasters are less recognised compared with social and economic dimensions. However, the loss of dense trees and the valuable ecosystem services these offer calls for environmental recovery to be a priority as well. A 2013 study reveals that large sums of taxpayers’ money is typically spent following disasters, whereas increasing pre-disaster investments can achieve cost savings and resilience. As an example, the territory government is offering relief payments between A$250 and A$650 for households that were without power for 72 hours or more. The importance of putting power lines underground was recognised more than a decade ago but the work is incomplete due to lack of political will. This is the time to ask questions such as: what will be the scale of devastation and cost and duration of recovery if a category 4 or 5 cyclone hits Darwin? The next cyclone after Marcus, Nora, was expected to be a category 4 storm but was downgraded to category 3 when it hit the western coast of Cape York on March 25. Why not prioritise transformation of critical infrastructure, such as shifting all power lines underground? What role can cost-benefit analysis play to achieve resilience to category 4 or 5 cyclones and other natural disasters? More broadly, how can we learn from the past? What are the new lessons we can take forward from Cyclone Marcus? And how do we inspire a city to work towards creating “Resilient Darwin’”? Six people lost their lives when Typhoon Doksuri smashed into central Vietnam on September 16, the most powerful storm in a decade to hit the country. Although widespread evacuations prevented a higher death toll, the impact on the region’s most vulnerable people will be extensive and lasting. Read more: Typhoon Haiyan: a perfect storm of corruption and neglect. Government sources report that more than 193,000 properties have been damaged, including 11,000 that were flooded. The storm also caused widespread damage to farmland, roads, and water and electricity infrastructure. Quang Binh and Ha Tinh provinces bore the brunt of the damage. Central Vietnam is often in the path of tropical storms and depressions that form in the East Sea, which can intensify to form tropical cyclones known as typhoons (the Pacific equivalent of an Atlantic hurricane). Typhoon Doksuri developed and tracked exactly as forecast, meaning that evacuations were relatively effective in saving lives. What’s more, the storm moved quickly over the affected area, delivering only 200-300 mm of rainfall and sparing the region the severe flooding now being experienced in Thailand. Doksuri is just one of a spate of severe tropical cyclones that have formed in recent weeks, in both the Pacific and Atlantic regions. Hurricanes Harvey, Irma and, most recently, Maria have attracted global media coverage, much of it focused on rarely considered angles such as urban planning, poverty, poor development, politics, the media coverage of disasters – as well as the perennial question of climate change. Disasters are finally being talked about as part of a discourse of systemic oppression – and this is a great step forward. In Vietnam, the root causes of disasters exist below the surface. The focus remains on the natural hazards that trigger disasters, rather than on the vulnerable conditions in which many people are forced to live. Unfortunately, the limited national disaster data in Vietnam does not allow an extensive analysis of risk. Our research in central Vietnam is working towards filling this gap and the development of more comprehensive flood mitigation measures. Central Vietnam has a long and exposed coastline. It consists of 14 coastal provinces and five provinces in the Central Highlands. The Truong Son mountain range rises to the west and the plains that stretch to the coast are fragmented and narrow. River systems are dense, short and steep, with rapid flows. These physical characteristics often combine with widespread human vulnerability, to deadly effect. We can see this in the impact of Typhoon Doksuri, but also to a lesser extent in the region’s annual floods. Flood risk map by province using Multi-Criteria Decision-Making method and the national disaster database. 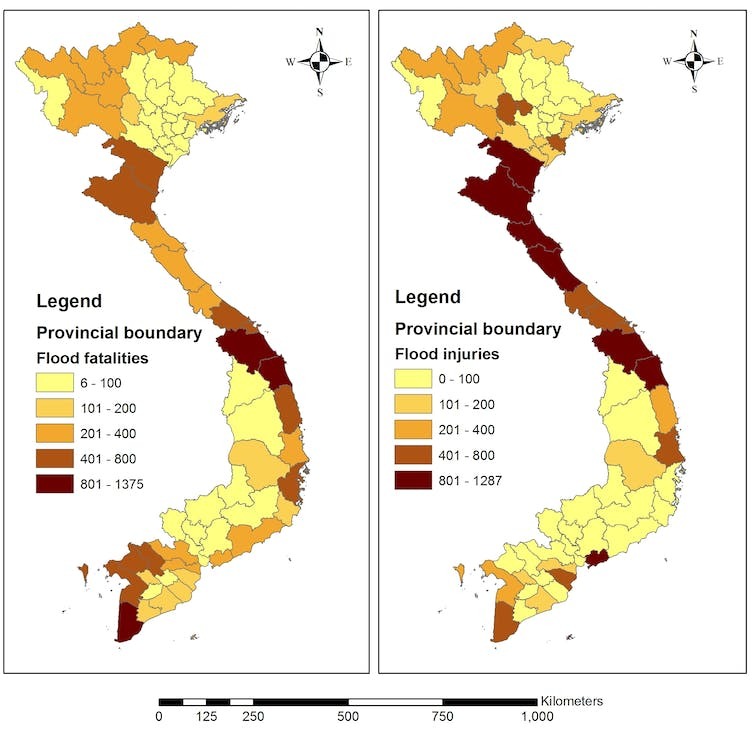 Rapid population growth, industrial development and agricultural expansion have all increased flood risk, especially in Vietnam’s riverine and coastal areas. Socially marginalised people often have to live in the most flood-prone places, sometimes as a result of forced displacement. Floods and storms therefore have a disproportionately large effect on poorer communities. Most people in central Vietnam depend on their natural environment for their livelihood, and a disaster like Doksuri can bring lasting suffering to a region where 30-50% of people are already in poverty. When disaster does strike, marginalised groups face even more difficulty because they typically lack access to public resources such as emergency relief and insurance. The rural poor will be particularly vulnerable after this storm. Affected households have received limited financial support from the local government, and many will depend entirely on charity for their recovery. This is not to say that Vietnam’s government did not mount a significant effect to prepare and respond to Typhoon Doksuri. But typically for Vietnam, where only the highest levels of government are trusted with important decisions, the response was bureaucratic and centralised. This approach can overlook the input of qualified experts, and lead to decisions being taken without enough data about disaster risk. Our research has generated a more detailed picture of disaster risk (focused on flood hazard) in the region. We have looked beyond historical loss statistics and collected data on hazards, exposure and vulnerability in Quang Nam province. Left: flooding hazard map for Quang Nam province. Right: risk of flooding impacts on residents, calculated on the basis of flood hazards from the left map, plus people’s exposure and vulnerability. Our findings show that much more accurate, sensitive and targeted flood protection is possible. The challenge is to provide it on a much wider scale, particularly in poor regions of the world. An effective risk management approach can help to reduce the impacts of flooding in central Vietnam. Before a disaster ever materialises, we can work to reduce risk – and avoid activities that exacerbate it – for example land grabbing for development, displacing the poor, environmental degradation, discrimination against minorities. Read more: Irma and Harvey: very different storms, but both affected by climate change. It is critical that subject experts, particularly scientists, are involved in decisions about disaster risk – in Vietnam and around the world. There must be a shift to more proactive approaches, guided by deep knowledge both of the local context and of the latest scientific advances. Our maps will help planners and politicians to recognise high-risk areas, prepare flood risk plans, and set priorities for both flood defences and responses to vulnerability. The maps are also valuable tools for communication. But at the same time as emphasising data-driven decisions, we also need to advocate for a humanising approach in dealing with some of the most oppressed, marginalised, poor and disadvantaged members of the global community. Decades of gentrification in London and other European cities (including Paris, Barcelona, Rome and Istanbul) have enacted a form of social cleansing. This has pushed away low-income and marginal residents, divided the rich from the poor, and generated inequalities among citizens. The Hammersmith area, where the Grenfell Tower is located, has been gentrified. This previously working-class area has been transformed into a vibrant middle-class neighbourhood. Just a few residential social housing tower blocks remain. As a cosmetic measure, the Grenfell Tower was refurbished in 2014. The choice of cladding material that appeared to fuel the fire is now subject to scrutiny, but with no understanding of the social dimensions of the building’s design regulation and safety measures. 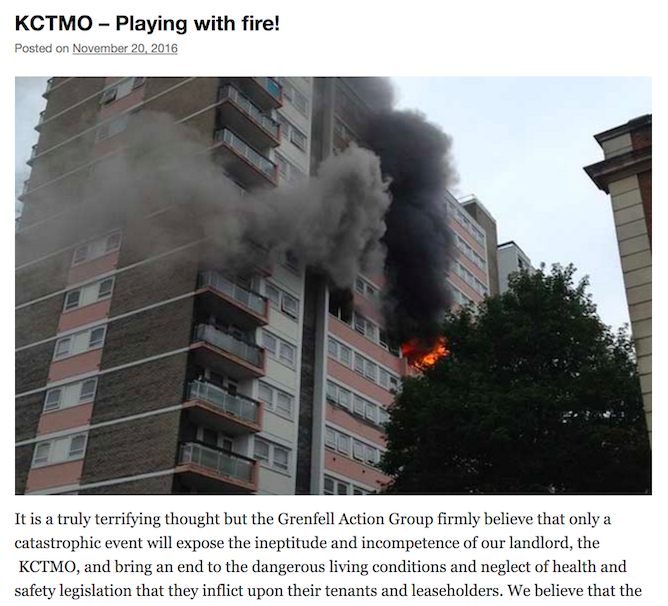 Repeated warnings from the Grenfell Tower residents that this was a disaster waiting to happen were ignored. There has been an outpouring of grief and anger from the affected community and beyond and tensions remain high. While certain elements of the media rebuke those seeking to hold the ruling class accountable, it is important to emphasise a simple truth: disasters are socially – and politically – constructed. Disasters are often misunderstood as “natural”, or simply assumed to be extreme and tragic events. This view draws on a century-old paradigm that puts the blame on rare and inescapable natural phenomena, an “act of God”, or technological breakdowns that lie beyond the everyday social fabric. But there is nothing natural about disasters; disasters usually have root causes of vulnerability that we don’t speak about and that reflect the day-to-day make-up of society – inequality, poverty, political ideology, class and power relations. These root causes are similar in London, New York, New Orleans, Port-au-Prince and Manila – a few of the world’s cities that have been stricken by major disasters in recent times. The Grenfell Action Group couldn’t have been clearer in its warnings of disaster – this one is from November 2016. Disasters as experienced today are often rooted in the historical development of societies. The impacts of colonialism, slavery, military conquest and discrimination based on class, gender, race and religion are visible today. Billions of people around the world, in both wealthy and less affluent countries, are at this moment suffering under structural injustices. As demonstrated at Grenfell Tower, this is a recipe for disaster. This disaster is quite a shock to British society. Although the contributing sociopolitical drivers (while sometimes not explicitly discussed) are perhaps more visible on this occasion, having struck a centre of wealth and power in London, we need to recognise that injustice lies at the core of almost all disasters. At the Grenfell Tower and around the world, the poor and the marginalised suffer the most from disasters. This injustice is not an accident – it is by design. There is no disaster that kills everyone in a particular locality nor one that knocks down all buildings in a single place. Normally the resources to overcome the impact of natural hazards are available locally. The privileged have access to these resources while those at the margin do not. Vulnerability to hazards, and related disasters, therefore mirrors how power and resources are unequally shared within societies. More often than not disasters affect people not because of a lack of knowledge about disasters, but because this knowledge is not applied. The residents of Grenfell were poor in a rich neighbourhood. They were those the market rejected, a burden on a borough apparently determined the rich should not pay to lift the constraints of the poor. The British political class has failed to adequately represent the interests of its most vulnerable citizens for decades. That people are consigned to live in such conditions in a wealthy country is at best a betrayal of the vulnerable by the state. Some would call it criminal. It is not only the Tories who must swallow this bitter pill. Cities tend to greatly magnify inequality. The Grenfell Tower disaster is a product of a deep societal divide in Britain, where wealth is increasingly concentrated among a small minority. Gentrification is pushing already marginalised people out of sight and out of mind. This kind of urban development is a boon for housing market profiteers and supports the ruling class agenda, but neglects the needs of the most needy in society. Marginal people become resourceless, invisible to public policies, and disempowered in public life. This increases their vulnerability. If cities are to reduce the risk of disasters like the Grenfell fire, we must focus on social justice in urban development. The benefits of development or redevelopment should prioritise the have-nots and provide dignity to people regardless of income or background. Cities that are able to provide opportunities for all citizens are also able to appreciate diversity rather than homogenisation. The Grenfell Tower fire exposes the injustice of disaster, and this terrible moment must be learned from and acted upon. Pushing people to the margins and deeming them worthless is ultimately what causes them to perish. North Koreans react as they march past the stand with North Korean leader Kim Jong-un during a military parade. Pundits often cite the North Korean regime’s crimes against its citizens as proof of Kim Jong-un’s irrationality as a leader. These crimes, as exhaustively documented by former High Court justice Michael Kirby for the UN Human Rights Council, are monstrous and inexcusable. Grave as they are, they do follow a discernible logic from the perspective of Kim’s efforts to consolidate his regime’s hold on power. Perversely, US President Donald Trump’s sabre-rattling plays into Kim’s logic of domestic power that positions the US as a dire threat, justifying the regime’s political repression. William Perry, US under secretary of state during the Clinton administration, has contended that Trump’s military brinkmanship increases the likelihood of coercing North Korea back to denuclearisation negotiations. This is the ground that a heightened threat of American attack will prompt Kim to recalculate the benefits of continued nuclear proliferation. But this scenario is only credible if Trump intends following through on the threat. This now appears more questionable given the controversy over the exact location of the USS Carl Vinson. Having established the foolishness of attacking North Korea in my previous article, I’d now like to prompt discussion on a couple of points. The first is how the “irrational Kim” rhetoric limits our ability to understand the complexity of the crisis in North Korea. This creates risks that perversely would compromise human rights and humanitarian goals. The second is to explore other options for improving human rights and humanitarian outcomes for North Koreans beyond the threat and application of military force. There is much emotion in debates over North Korea, and rightly so. Many North Korenas have experienced much suffering and trauma, as well as the lingering anguish of the Korean War and the separation of families by the partition of Korea. This is precisely why analysts need to carefully weigh up the risks and rewards of policy choices: to do justice to that suffering, and to ensure we do not recommend misadventures that could add further misery to the North Korean people. Considering the risks to civilians posed by a war of regime change, it is difficult to mount a case for war as a vehicle for improving human rights and humanitarian outcomes for the North Korean people. The discourse on human rights in North Korea has long been framed through the lens of national security. Policy issues become “securitised” when proponents of an issue area frame it as an existential security threat, of high priority, that requires extraordinary measures and rapid action to tackle. Because such issues become framed in the language of security, military-based solutions often come to dominate policy prescriptions. The “crazy Kim” argument has been central to the security rhetoric around human rights in North Korea. This locks possible solutions into a narrow spectrum focused on military force and coercion. Just as doctors undertake to “first do no harm”, so too should foreign-policy-makers be wary of strategic choices that carry a high risk of making things worse. Many Korea analysts have pointed to Seoul’s vulnerability, and the risk to millions of South Koreans, posed by a cascading escalation of US military action into full-scale war. That risk also applies to people living in population centres north of the demilitarised zone. As the Iraq example again illustrates, removing a dictator in a war of regime change is not a guarantee that human rights and humanitarian outcomes will improve. According to the Iraq Body Count project, 119,915 Iraqi deaths were verifiably attributed to the conflict in that country from 2003 to 2011. Another study published in PLOS Medicine journal put the death toll at half-a-million Iraqi civilians. Either way, this death toll and suffering escalated well beyond the scale of human rights abuses and deaths that occurred under Saddam Hussein’s regime. This is not to downplay the suffering of those persecuted under Hussein, but to recognise that the invasion of Iraq made a bad situation worse. Could we see similar casualty numbers in a war in North Korea? North Korea is an urbanised country. Approximately 60% of people are concentrated in larger urban centres. In the event of full-scale escalation, air strikes are likely to target critical infrastructure in an effort to weaken the fighting and logistical capacity of the Kim regime. Many of these targets will be in urban centres, exposing civilians to attack. We should be mindful of the humanitarian cost of the damage of war to the North Korean economy, industry, agriculture and key infrastructure. Targeting of critical energy, transportation and sanitation infrastructure will no doubt weaken North Korea’s fighting capacity, but also eliminate those critical services for civilians. Food production and distribution networks are likely to be disrupted. For a country that is already chronically food insecure, any damage to food production and distribution systems will have immediate impacts on increasing malnutrition and starvation. Consider that estimates of deaths from North Korea’s “Arduous March” famine in the mid-1990s sit at approximately 600,000 after the collapse of the country’s food production and distribution system. The elimination of services for civilians is likely to increase the risk of non-combat casualties from malnutrition, disease, and the elements – particularly during North Korea’s harsh winter. If such a war ends quickly and an occupation force arrives in North Korea to restore security, casualty figures will be still be high. However, some of the longer-term impacts of human insecurity might be avoided. However, in the event the post-regime environment is unstable, then casualty figures for North Koreans on a scale similar to Iraq become more likely. Removing Kim Jong-un as the head of the regime does not automatically translate into a win for human rights. A lot of post-conflict nation-building has to take place if a war scenario is to transcend the immediate humanitarian disaster and create an environment in which human rights for the North Korean people can be improved. Human rights are best guaranteed by stable governance, strong political institutions, legal protections, active civil society, and broad material wellbeing. A post-conflict North Korea in which the Kim regime has been removed would effectively be a failed state. None of these facilitating conditions for human rights guarantees would yet exist. It takes time and resources to cultivate the institutions of a stable state. It requires many years of patient networking, conversation and compromise to develop a social movement that could evolve into an active civil society. It takes even longer to cultivate a political culture in which the citizenry respects the integrity of the political system even when their faction is not in power. Without this social infrastructure, Kim Jong-un’s removal is likely to lead to the disintegration of North Korea into a failed state, paving the way for the emergence of another authoritarian strongman. In South Korea, it took more than 40 years after the conclusion of the Korean War, an ongoing American military occupation, and the development of a broad-based pro-democracy movement, for an imperfect democratic political system to evolve. 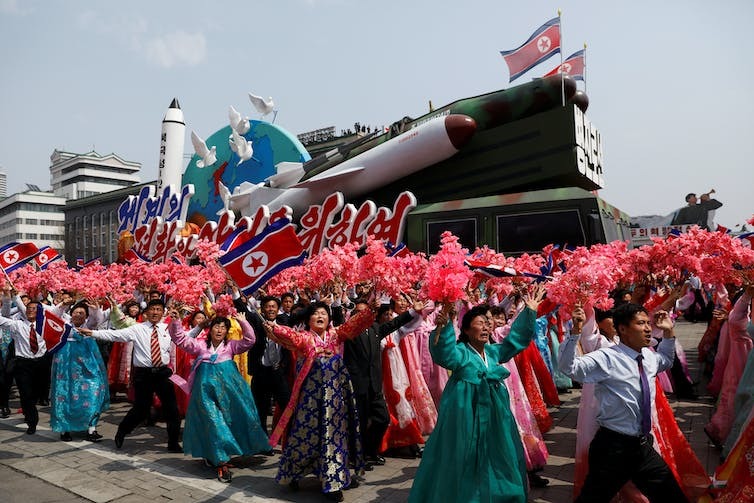 To suggest this process could be circumvented in North Korea does not accord with the findings of research into democratisation and social movements. These norms, rules and institutions should ideally be developed by the North Korean people over time, not impatiently imposed from outside by other powers. It is doubtful that Trump – and, more importantly, his core political support base – has the stomach for the massive long-term, high-cost commitment that nation-building in a post-Kim North Korea would entail. One could be forgiven for observing the current US-North Korea standoff as a game played by privileged men in suits on either side, gambling with the lives of ordinary citizens. Millions of lives on both sides of the demilitarised zone and beyond are placed at unnecessary risk through such high-stakes brinkmanship. It is easy for leaders to talk tough on non-proliferation and human rights enforcement. But it is quite another to bring about international norms in these fields in such a tricky strategic context as the Korean Peninsula. Unfortunately, Trump’s penchant for military posturing does little to increase the likelihood of denuclearising North Korea, or improving human rights outcomes for its citizens. Instead, the Trump administration’s bellicose rhetoric inadvertently legitimises North Korea’s justifications for its nuclear weapons program, along with the domestic coercive apparatus that persecutes North Korean citizens. Guaranteeing human rights in North Korea will ultimately require new institutions, new laws, a domestic civil society, cultural change, and a process of justice for past abuses. This is a project far beyond the scope of military action, requiring patience, innovative thinking and disciplined strategic restraint on the part of policymakers. And they must recognise the unique strategic circumstances of the Korean Peninsula.